In chapter 7 of my book The Gentile Times Reconsidered (3rd ed. 1998; henceforth GTR-3), I discussed some attempts to overcome the crushing burden of evidence that exists against the Watch Tower Society’s date of 607 BCE for the destruction of Jerusalem. In that chapter, I also briefly described a few “unofficial defenses written by scholarly Witnesses,” including two failed attempts that Rolf Furuli wrote and that were sent to me from Norway in 1987 and 1990. I believe I gave a fair and polite description of Furuli’s two papers in my book. I treated him with respect and mercy, passing over details that I knew would be embarrassing to him. Because I suspected that Furuli might respond to my description of what happened, I made sure that all the details were correct. I can document everything I wrote in GTR-3 about his two papers, as I saved my correspondence with the Norwegian Jehovah’s Witnesses (and others involved) who contacted me after they read Furuli’s papers. Some of these Witnesses had corresponded with him and/or visited him to discuss the chronology. I never asked them to do so, but some of these Witnesses wrote to me and described their conversations with Furuli, and some of them sent me copies of their correspondence with him. They did so because they wanted my opinion of what Furuli had said or written. In mid-July 2003, a correspondent sent me an email that called attention to Rolf Furuli’s having written a “Response” to what I wrote about him in my book; the response was published in various ways on the Internet (e.g., on the Web site http://www.geocities.com/yhwhbible/furuli.htm). It grieves me that Furuli has painted a warped picture of what took place in connection with his papers and that he has repeatedly claimed that I didn’t tell the truth, that I gave a false presentation of the facts and thus misinformed readers, and that my rebuttal of his papers was unethical and immoral. None of these statements is true. I have no wish to skewer anyone publicly. In connection with Philip Couture’s (an American Jehovah’s Witness) and Furuli’s papers, I wrote to both of them (to Furuli twice) and told them so and said that I would prefer to have private discussions with them about the Society’s chronology in a friendly, scholarly and Christian manner, instead of dealing with their criticism publicly in a coming edition of my book. Neither of them responded to my offer. Because Furuli has now gone public with a distorted version of the course of events I described in my book, I’m forced to disclose the facts about his claims and actions, including some of the less honorable ones. Did Furuli forbid his friend to lend his paper to others? “One evening in January  he [Furuli] quite unexpectedly called me on the phone, after we had not seen each other for many years, and had not discussed Biblical questions since the beginning of the 1970’s, to hear, as he said, what I felt about the unrest that existed here in this area to which he knew I had moved a few years earlier. During our conversation we found out that both of us had read your and Raymond Franz’ books, and he then invited me to visit them in Oslo on a weekend some weeks later. Why he called me just at that time I don’t know, but a few weeks earlier I had written to the Society regarding disfellowshippings and other matters. “On Saturday, when all four of us [their wives included] were discussing the Gentile times, he took out his ‘tied-up’ [in Norwegian, ‘innbundne’] manuscript that I was allowed to take with me home, and before we left he advised Kirsten [Philipsen’s wife] against reading your book, and gave her his handwritten Biblical passages in Hebrew, plus a copy of Boscawen’s Addenda on the three kings from the [Ancient Near] East. He said nothing to the effect that his notes could not be read by others than myself, and I therefore lent them out to several others here, and he has never blamed me for that.”—Letter from Philipsen to Jonsson, dated August 26, 1987. “Unworked notes.” Why wasn’t anyone told? The paper that Furuli handed over to Philipsen, a ‘tied-up’ manuscript of more than 110 pages, was well organized, containing a title, an introduction, chapter divisions and chapter headings, subheadings, etc., and a bibliography at the end. The manuscript was a systematically organized attempt to refute my book. No one could get the impression that it was just some “unworked notes” or that it didn’t represent Furuli’s detailed views. Furuli didn’t tell Philipsen so, nor did he tell him that the notes contained views and arguments he no longer believed himself and that it therefore would be “wrong to quote them as an expression of my present viewpoints.” Because Furuli hadn’t forbidden him to lend the manuscript to others or to make copies of it, Philipsen shared the material with several friends. He, like others who read it, got the definite impression that this manuscript was Furuli’s promised “answer” to my book, and Furuli didn’t tell him otherwise. Roar Henriksen, a former third-generation Jehovah’s Witness in Langesund, Norway, who broke with the organization a few weeks earlier, sent me Furuli’s manuscript on February 4, 1987. 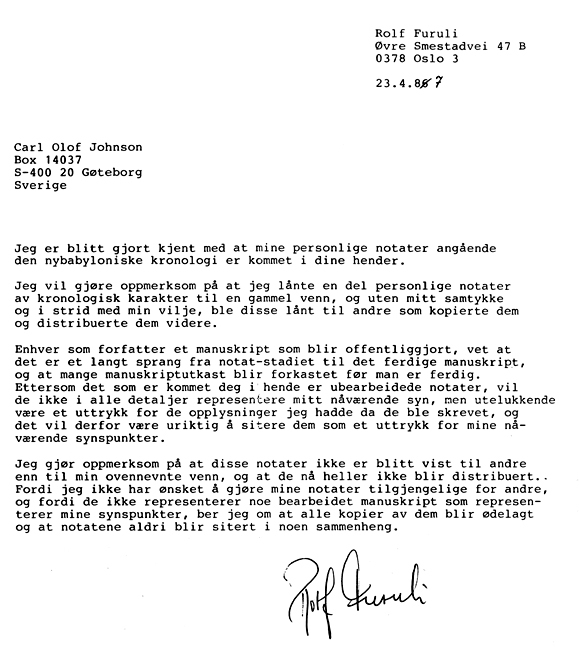 In the accompanying letter, Henriksen referred to the rumor that Furuli had been preparing an “answer” to my book, stating: “Here you have the result.” (Letter from Henriksen to Jonsson, February 4, 1987) He, too, pointed out in his letter that Furuli hadn’t asked that the material not be copied, and because the manuscript didn’t contain a copyright, he felt free to give me a copy and ask for my comments. Henriksen felt it was quite in order to let an author have a look at criticism of his book. I later came to know Philipsen and Henriksen personally and found them to be honest, sincere and trustworthy men, as well as Christians with a strong faith in God’s Word. For a couple of years, rumors had circulated among the Witnesses in Norway, and to some extent among the Witnesses in Sweden, that Furuli was preparing a treatise that would refute my book. So when his paper of more than 110 pages came into my hands, I took it for granted that the manuscript was his promised “refutation.” Upon reading it, I found that Furuli not only criticized my book, but repeatedly questioned my motives, honesty, faith in God and his Word, and so on. Because we had never met and he evidently knew nothing about me aside from my book, I took this questioning for what it obviously was—a reflection of the usual negative attitude that loyal Witnesses have of so-called “apostates”, something I had become used to. In an answer to Henriksen dated February 13, 1987, I made some critical comments about Furuli’s material and promised to work on a more detailed refutation as soon as I found some time. I also sent Henriksen a copy of my booklet, The Watch Tower Society and Absolute Chronology, published in 1981 under the pen-name Karl Burganger. I also forwarded the booklet and my initial critical comments to Philipsen, who presented them to Furuli later in February. In this way, Furuli found out that someone had sent his material to me, and in a letter to Philipsen dated March 1, 1987, he deplored that his notes “had come into the hands of disfellowshiped persons.” In his “Response” Furuli now claims that, “When I realized this, I wrote a letter to Jonsson and pointed out that the notes were copied against my will” and that he asked me to destroy them. Furuli’s statement isn’t true. He didn’t send me a letter at this time, nor did he tell Philipsen that his material was just “unworked notes” that “not in all details” represented his own views. Did Furuli send his letter to me before or after my rebuttal? This presentation of the events is false. To be able to accuse me of “unethical” conduct, Furuli turns the course of events upside-down. He misrepresents the order of events by claiming (1) that he wrote to me when he realized [in February, 1987] that someone had sent his “notes” to me, (2) that I then didn’t comply with his request, (3) that I wrote my rebuttal after I had received his request, and (4) that only then did my rebuttal finally reach him. The actual course of events is as follows: (1) Soon after Furuli’s manuscript reached me early in February 1987, I began work on a rebuttal. (2) I sent the first part of my rebuttal, a discussion of 31 pages, to my Norwegian correspondents on April 10, and Philipsen at once sent a copy of it to Furuli. (3) About a week after Furuli received my rebuttal, he sent me a letter dated April 23. [His letter was actually dated “23.4.86”, which was an obvious typing error for “23.4.87.”] I immmediately wrote to Furuli in a letter dated April 27, 1987, telling him that I would comply with his requests provided that he, too, stop circulating his paper and put an end to the false rumor that he had refuted my book. In his April 23 letter, Furuli for the first time explained to one of us who had his material that it was just “unworked notes” that “not in all details represent my present view,” and that “it is wrong to quote them as an expression of my present viewpoints.” If these comments reflected how Furuli viewed his material when he first shared it with Philipsen in January 1987, why didn’t he inform him? And when later in February he found out that Philipsen had shared the material with other Witnesses, and that I, too, had received a copy, why didn’t he inform anyone that the manuscript wasn’t an expression of his own viewpoints? It was only after he had received the first 31 pages of my refutation that he began to describe his manuscript as “unworked notes” that “not in all details” represented his present viewpoints. Did I have to guess about Furuli’s reaction to my rebuttal? That Furuli’s letter was an attempt to stop the circulation of my rebuttal is obvious. In his letter, he explicitly asked me to destroy my copy of his manuscript and never quote from it in any context. This request, of course, implied that he didn’t want me to circulate my rebuttal, which contained numerous quotations from his manuscript. As shown earlier, a copy of the first part of my rebuttal came into Furuli’s hands about a week before he wrote to me. His version of the story, however, which is demonstrably false, is that he didn’t get the copy until a long time after he wrote to me. That’s why he claims that he hadn’t read my rebuttal when he sent his letter. It seems obvious, then, that the real reason Furuli wrote to me was that my rebuttal reached him the week before. Thus, I didn’t have to read Furuli’s thoughts, and I didn’t have to speculate about Furuli’s reactions to my rebuttal, and therefore I didn’t, as Furuli claims, commit “a methodological blunder, which a balanced researcher should not commit.” My statement about his reaction was based on his own admissions to fellow Witnesses. Did Furuli stop the circulation of his paper? As explained above, upon receiving Furuli’s letter of April 23, I at once sent him an answer, dated April 27, 1987, in which I promised not to circulate his notes or quote from them and to stop the distribution of the first part of my refutation of them, provided that he, too, stop the circulation of his manuscript and also explain to the Norwegian Witnesses that the rumor that he had written a treatise in which he refuted my book was false. I soon found out, however, that he continued to share his manuscript with other Witnesses. Here again, Furuli isn’t telling the truth. Norwegian Witnesses informed me that Furuli continued to circulate his paper (his “unfinished notes”) after I answered his letter. And he was still doing so as late as 1990, when some Witnesses in Norway wrote to me and told me that Furuli had lent his first paper or parts thereof to several Witnesses, among them an elder in Oslo, Danne Mattson, and other elders in the city of Bergen (including R. Instebø). I also found out that these Witnesses used the paper in their discussions about the Society’s chronology.—Letter from Jan & Wenche Kalstø to Jonsson, dated September 20, 1990. In other places in Norway, too, elders continued to defend the Society’s chronology by referring to Furuli’s “refutation” of my book. Clearly, then, Furuli did nothing to end this false rumor, and so, because he didn’t stick to our agreement, I saw no reason to destroy his paper or prevent the Norwegian Witnesses from circulating my rebuttal. Instead, I decided to continue working on the remaining two parts of my rebuttal. Another set of “unfinished notes”? “Even if the material you want to read is a finished work [in Norwegian, “ferdig bearbeitet”], I do not want it to fall into the hands of disfellowshipped persons, and am, therefore, keeping down the copies of it.”—Letter from Furuli to Åge Grønning dated July 22, 1990. Furuli was apparently so afraid that his new paper would fall into my hands that he lent it only to Witnesses he fully trusted. These people, in turn, weren’t allowed to copy it or share it with other Witnesses. They were allowed to let other Witnesses who had been disturbed after reading my book read it, but only in their presence and under their supervision. (Letter from Jan & Wenche Kalstø to Furuli, dated January 1, 1991) Thus Furuli sought to prevent his criticism from reaching the author of the book he was criticizing. He sought to prevent the Witnesses from hearing what the author himself had to say about the criticism of his book. He wanted to keep the stage and the audience for himself. What scholar who wants to be taken seriously would surround his criticism of another scholar’s work with rules aimed at preventing the scholar he’s criticizing from reading and responding to his criticism? Furuli claims that one of the Witnesses to whom he had lent his second paper (Jan Kalstø) “went straight away to a copying machine and the new set of unfinished notes [sic!] were immediately sent to Jonsson.” This statement is a groundless guess. Kalstø did not do that. But he did make the contents of part of the material known to me in another way. Also, Furuli had shared his new material, wholly or in part, with other Witnesses, so other people, including Grønning, sent different parts of the 36 pages to me. In this way, I finally received the whole paper and had the opportunity to read it and prepare a refutation. When, a few months later, Jan and Wenche Kalstø decided to leave the Witness organization, they wrote a letter to Furuli that included copies of the letters from Wiseman and Walker and pointed out that he had lied to them. They explained that one of the reasons for their decision to leave the organization was the dishonest methods he and other Witnesses used.—Letter from Jan & Wenche Kalstø to Rolf Furuli, dated January 1, 1991. I find no pleasure in describing the shortcomings of others, either publicly or privately, and I usually refrain from doing so. No one is perfect, and I’m well aware of my own faults. That I have here made known the above information about Furuli’s statements and conduct, therefore, is a rare exception that I feel forced into by his decision to publicize false statements. About a month ago, around the end of July and not long after Rolf Furuli’s ”Response” to me was made public on the internet, Furuli also published a new book, Persian Chronology and the Length of the Babylonian Exile of the Jews (Oslo: Rolf Furuli A/S, 2003). A closer look at the book reveals that this is just another ”strawman,” one more abortive attempt to overcome the evidence against the Watchtower Society’s chronology. This needs to be demonstrated, of course, and the book will be dealt with to all the recognized rules in due time on this site and elsewhere. in defense of some of Furuli’s claims. Like Furuli’s “Response,” Mattsson’s statement is based on a distortion of facts, so I will here clarify the facts. Dan-Ake Mattsson says he is not concerned with differences “based on the details persons remember and do not remember fifteen years after the events.” Because my above disproof was not based on memory or conjecture, but on written correspondence I received in 1987, 1990, and 1991, Mattsson’s reference to what “court psychologists” say, etc. is irrelevant. “We have read Furuli’s answer [of 23 April, 1987], where he claims that the treatise has only been lent out to his ‘faithless friend’. This is not the case. An elder in Oslo, Danne Mattson, has been allowed to read it and referred from [Norwegian: ‘refererte fra’] this work for us; it is generally known among the friends in the Oslo area that Furuli has refuted your book. Also in Bergen individual elders have been lent parts [italics added] of Furuli’s works and have referred to them in their ministry.”—Letter from Jan and Wenche Kalstø in Sandefjord, Norway, to Jonsson, dated 20 September, 1990. The question, then, is: Who is telling the truth, Jan & Wenche Kalstø or Dan-Ake Mattsson? If Mattsson insists that Jan & Wenche Kalstø lied about Instebø and him in their letters, this is an issue between them and him. Unfortunately, I have not been able to get in touch with either of them. As I said, Jan Kalstø left Norway for a trip around the world in his sailboat in August 2003, and I don’t know how to contact him. Nevertheless, it is doubtful that the Kalstø’s would have lied about who received parts of Furuli’s manuscript so long ago. There would have been no point to it. Furuli could easily clear this up by publishing a copy of the Kalstø’s 1 January, 1991 letter to him (or at least, the relevant statements) on the Internet, along with the answer he may have sent them. Mattsson claims that he uses the data I gave in my above disproof as a basis for his discussion. But he does not! On the contrary, he erroneously states (point 3) that Furuli wrote me a letter dated “23 February 1987”, asking me to destroy his “notes”, and that (point 4), instead of destroying the notes, I “made a ‘rebuttal’ of 31 pages”. These are not the data I gave, as anyone can see in my above disproof. Furuli did not write me a letter dated “23 February 1987”. As I pointed out, the letter he wrote was dated two months later, 23 April, and I received it more than two weeks after I sent my 31-page rebuttal to my Norwegian correspondents. Like Furuli in his “Response,” then, Mattsson turns the course of events upside-down, claiming that I wrote my 31-page rebuttal after Furuli sent me his letter, so as to be able to accuse me of “unethical” conduct. Because Mattsson’s discussion of the “ethical side” is based on these false statements, his conclusions are, of course, groundless. 1. 4 February 1987: Furuli’s manuscript is sent to me. 2. 10 April 1987: I send a 31 page rebuttal to my Norwegian friends, who immediately send it to Furuli. 3. 23 February 1987: Furuli writes me a letter telling me to destroy his manuscript, about a week after he received my 31 page rebuttal. 4. At an unspecified time after 1., 2., and 3., I make a rebuttal of 31 pages, and add 62 more pages to it. Mattsson obviously has 2., 3. and 4. wrong, because if he claims his dates are correct, then 2. and 3. must be reversed in time. But then the sequence of events conflicts, because if Furuli received my 31 page rebuttal from my friends about 16 February, then I cannot have sent it to my friends on 10 April. But if 3. should be dated 23 April, as I stated above, then Mattsson’s claim in 4. is false. Obviously then, if Mattsson is unable correctly to give the times of four simple events, then he has no business claiming that he’s used time-dependent “data” to refute anything I’ve written. With Furuli’s permission, I am willing to publish on the Internet a copy of his 23 April letter to me. Furuli could help clear the air on the date of this letter by giving me such permission, and by publishing his own copy (presuming he kept one) of the letter. We would then see who is telling the truth. It may be added that I shared copies of his letter with my Norwegian correspondents at that time, so they, too, know very well when Furuli wrote his letter. It’s true that I later decided to write the two subsequent parts of my refutation (62 additional pages). I did this because of the information I received that Furuli, contrary to his implication that he would not, allowed his so-called “unfinished notes” to be circulated, wholly or in part, among Witnesses in Norway. Furuli and Mattsson both deny this. So far, however, they have not been able to present any factual evidence, such as copies of letters, indicating that my sources of information were and are unreliable. Are Furuli and Mattsson prepared to publicly accuse Jan & Wenche Kalstø of lying? Mattsson ends by stating that he felt obliged to write his statement “because Jonsson has distorted the facts, and I know these facts.” As has been demonstrated above, it is Mattsson who has distorted the facts. Whether he has done so deliberately or not, I don’t know. If he really knows the facts, as he claims, then he has deliberately distorted them. Since the above ”Postscript” was written, Dan-Ake Mattsson has published an ”Addendum” to his ”Statement”, claiming that Carl Olof Jonsson ”twisted” his statements. He certainly did not. Since Mattsson also added some further distortions of Jonsson’s statements above, his ”Addendum” calls for correction. Mattsson claims that ”It was Jonsson who started the whole thing by giving false information regarding Furuli in his book.” As Jonsson has alreday shown, this is not in harmony with the facts. I have copies of most of the relevant letters and papers pertaining to this affair and I admire Jonsson´s calmness when writing about it in his book. Having the same information I personally would not have been as kind as Jonsson was if I were to write about it. There certainly was no reason not to accept the testimony of the Norwegian people who wrote to Jonsson about it. And that testimony was crystal clear: Furuli continued to let his material circulate after he wrote to Jonsson. It was not ”bad judgment” to accept these letters at face value. I know several of the people involved in Norway and they affirmed that Furuli’s material continued to circulate. None of them was informed by Furuli that his material was just ”unworked notes” that did not ”represent his present views” and therefore should be destroyed. Not even his old friend whom he had first lent the manuscript was informed about this. Furuli evidently felt it was only Jonsson who should be told this! It cannot be doubted, therefore, that Furuli himself was largely responsible for the circulation of his manuscript. I strongly adviced Jonsson to deal with this publicly in the 3rd edition of his book in English. And reluctantly he did so. Jonsson, after receiving Furuli’s letter, wanted to comply with Furuli’s wish not to circulate his rebuttal. This was also natural, for Jonsson, as his letter to Furuli shows, wanted to have a private dialogue with Furuli and sort out the issues re chronology between them. I have known Jonsson since 1974, and he is one of the most peaceful, fair and honest persons I know. He also has a firm belief in the Scriptures. But Furuli obviously did not want such a dialoge. However, it was only when reliable reports indicated that distribution of Furuli’s material continued, that Carl decided to distribute his rebuttal again. And the letters and other information received from Norway clearly showed that Furuli blackened Jonsson in a most vicious way. In a letter dated ”22.7.90” he even went as far as to claim that Jonsson had ”stolen” his ”unfinished notes” - an outrageous lie! The two sets of Furuli’s written material received from different parts of Norway also conveyed the impression that Jonsson was dishonest! I have copies of these sets and can testify that the 110-page manuscript as received many years ago does not contain a lot of pencil notes as Mattsson claims that the copy he now has seen does. There are only a few notes in the copy I have. Obviously the bulk of the pencil notes etc were added later when Furuli had read Jonsson’s refutation of the manuscript. In a letter received from Norway dated ”20/9-90” it was stated that Mattsson had read the manuscript and had referred to its content in a conversation with the one who wrote this letter. In spite of what Mattsson claims, I still believe that the letter tells the truth. This does not necessarily mean that Mattson is now lying. I rather believe that his memory does not serve him well. However, his claim that as Jehovah’s Witnesses he and Furuli could not lie is unfounded. My study of the history of the Watchtower organization has made it quite clear that Witnesses are capable of lying when the interests of the organization so demands. However, this is exactly what Jonsson did not do. Furuli sent him his letter after, not before, he had received his rebuttal of 31 pages. As anyone can see, the letter is clearly dated, not in February as Furuli and Mattsson claim, but on 23 April, just as Jonsson wrote in his book. This was about two weeks after he had sent the first part of his rebuttal to Norway on April 10, and about a week after Furuli had received a copy of it. The date of Furuli’s letter definitely and irrevocably disproves Furuli’s and Mattsson’s version of the event. Let us hope that the hard facts shown here will settle the matter.